With this second "Simple and Satisfying" post, I seem to have created a new series for the blog. This is another one of those dishes that comes together quickly when you don't have much in the pantry and are looking for something you can throw together for an impromptu meal. Couscous are an excellent grain to always have on hand, as they can go from pantry to table in less than half an hour. The beauty of this recipe is that it can be used as a template. I happened to have a couple of cups of chopped butternut squash left over from something I made earlier in the week, but any vegetable will do - sweet potato, zucchini, green beans, carrots, bell peppers - pretty much anything you have in the refrigerator. You could even use spinach or Swiss chard, or other greens. If you don't have chicken or vegetable broth, use water and add dried herbs. Use raisins, cranberries, dates or any other dried fruit to add a touch of sweetness. If you don't have pistachios on hand, walnuts or pine nuts would make a particularly good substitute, but any nut will do. You basically want the fruit for a touch of sweetness and the nuts for texture as well as for taste. Place squash in a small saucepan and add enough water to cover. Bring to a boil. Lower heat and simmer for 10 minutes, until the squash is tender. Remove from the heat and shock the cooked squash in cold water, then drain. Bring the chicken broth to a boil in a 3-quart saucepan over high heat. Season to taste with salt. Add couscous and dried mango and cover, turning the heat as low as it will go. Let it simmer for two minutes. Add the butternut squash, cover, and remove from the heat. Let sit for 15 minutes. 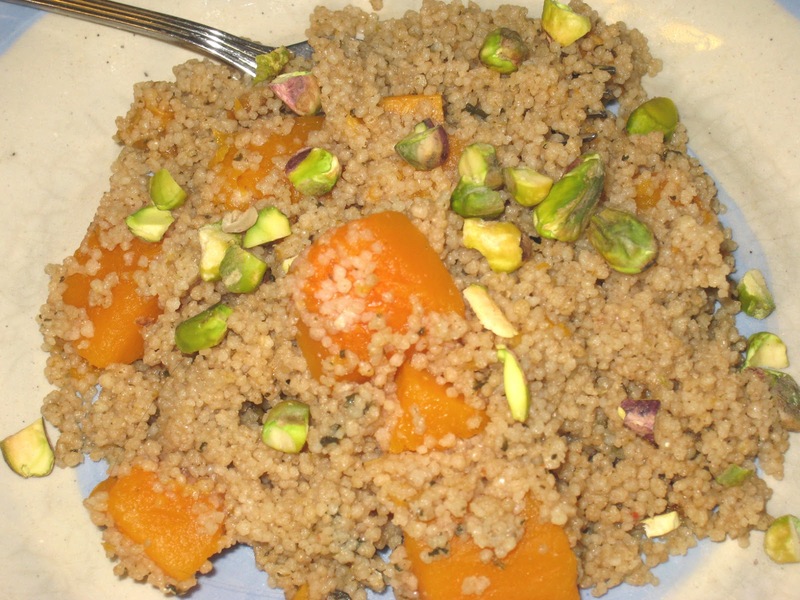 Fluff the couscous with a fork, being careful not to mash the squash. Top each plate of the couscous and butternut squash with the toasted pistachios before serving.